The maximum we have seen Saudi Arabia produce in recent years is around 9.5 million barrels/day. The question is whether they could produce more as a result of recent megaprojects. Above is the new capacity program (according to the Wikipedia Oil MegaProjects Page). They are close to wrapping up these additions. Saudi Arabia aims to boost its total oil production capacity to 12.5 million bpd by the end of next year. The kingdom has a long-held policy of keeping 1.5 million bpd to 2.0 million bpd of spare capacity to meet any unexpected outages in global supply. So presumably the maximally optimistic-but-reasonable position is that the highest production that could be deployed just to control prices is 11mbd, with 1.5mbd being always saved for some kind of physical disruption of supply somewhere, and thus not commercially deployable. Personally, I'm on the end of the spectrum that thinks it's unlikely these new projects will do much more than replace declines elsewhere. 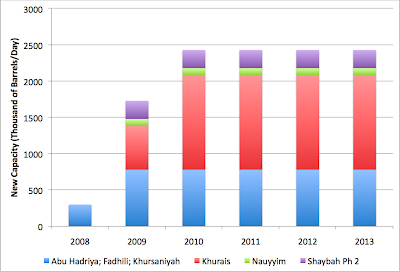 We know that Abqaiq has been declining for years (see the very important analysis at Satellite O'er the Desert). And I strongly suspect that North Ghawar is in a condition where declines have begun and are likely to be ongoing. However, I think the total amount of oil in Saudi Arabia is too large for production to fall too far below recent levels any time soon, especially with a pile of new capacity just being introduced. So I think the maximally pessimist-but-reasonable position is that production cannot go over the 9.5mbd level seen recently (absent a physical supply disruption elsewhere). On Monday, I will put together everything I have done over the last few weeks in an attempt to constrain the timing of the second shock, although the big Iraq wild card will still need to be explored.